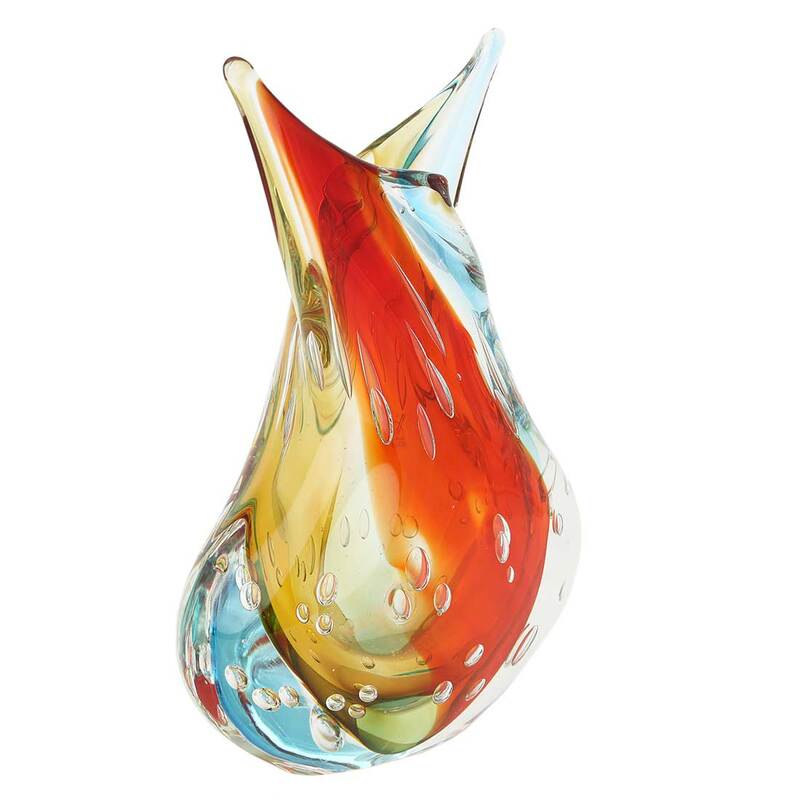 This fabulous Murano Glass Vase presents a contemporary take on classic Venetian style. 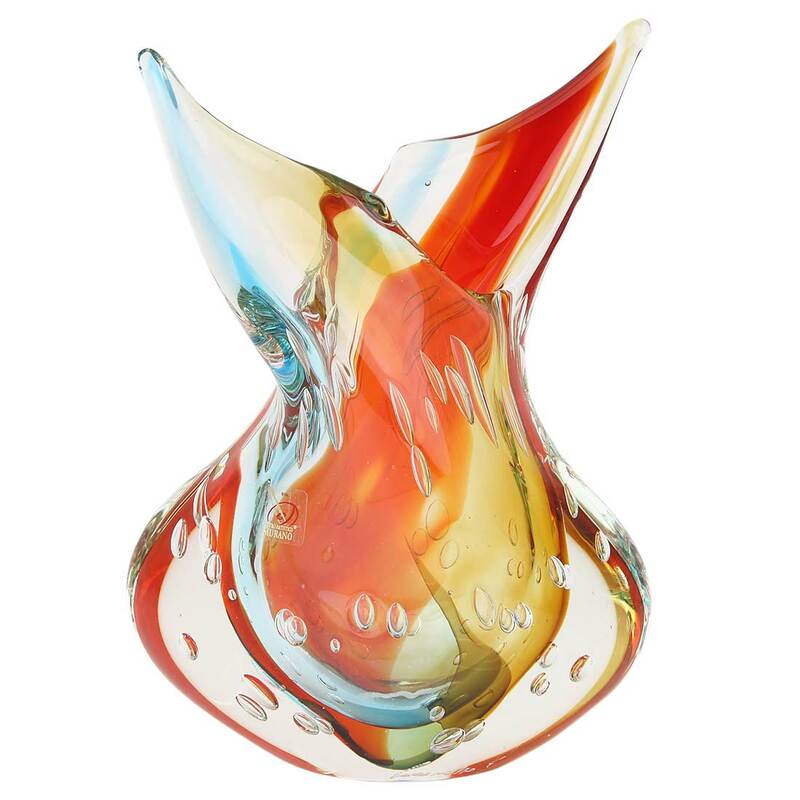 The Venetian vase showcases the famous Sommerso technique invented by Murano Glass artists in the 1930's, which together with beautiful form and unique design make this vase a real eye-catcher in any home or office. 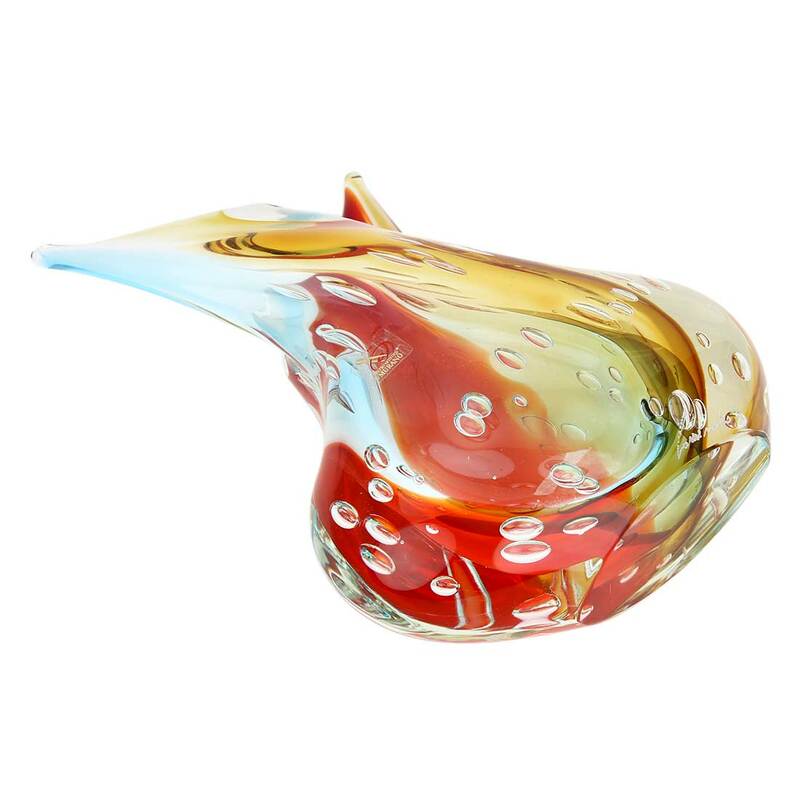 Famous Murano Glass artists, whose works are featured in museums and fine galleries worldwide, lovingly handcrafted this vase, artfully mixing the elements of traditional and modern. 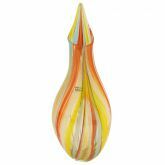 The unique nature-inspired shape and elegant yet bold color palette makes this vase an instant conversation piece. The pattern of randomly-shaped bubbles throughout the glass, a characteristic feature of coveted Bullicante technique, completes the impression of artistic elegance and handcrafted beauty. Despite its fragile look, this vase is heavy and made to become a family heirloom lasting through generations. 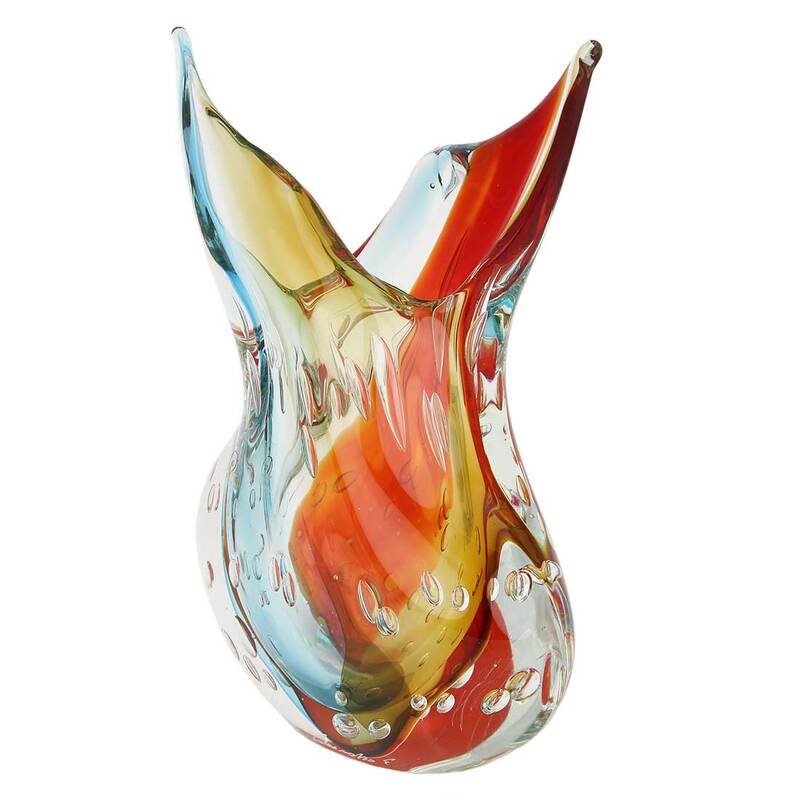 Classic and trendy at the same time, this Murano Sommerso vase makes a fine gift for momentous occasions such as birthdays, anniversaries, or weddings. Measurements: This Venetian glass vase measures about 10 inches in height. It measures about 7 inches in width in its widest bottom part, and 3-1/2 inches in its narrowest part at the neck. It is very well packaged to avoid breakage in transit. Authenticity: This authentic Murano Glass Vase comes with the signature of the glass artist, the sticker of Murano's official Glassmakers' Consortium and the certificate of authenticity. My husband and I are thrilled with our new piece. We’ve picked the perfect spot to show it off. Stunning!!!!! Absolutely love my Venetian Sunrise vase. Colors are true as shown. Exactly what I was hoping it to look like. Looks perfect on my cocktail table in the living room. The colors are so great!! 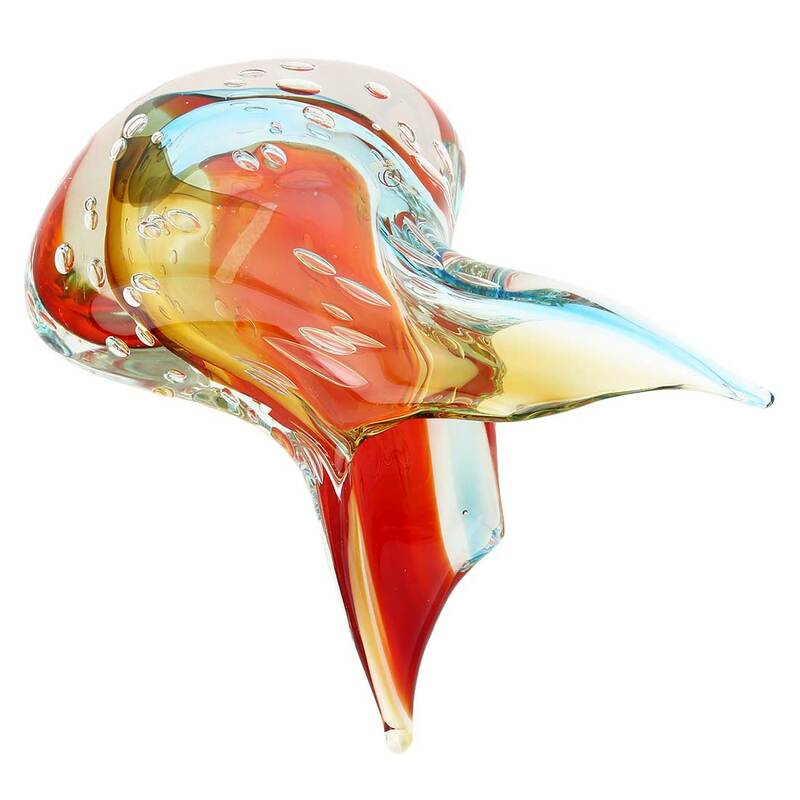 Murano glass is very special and amazingly beautiful. I first fell in love with it in Venice and have cherished it since. It's vibrant colors sparkle through the bubbly glass shapes like awesome jewels. It brings such pleasure to my day. "Venus", as she has been aptly named, was a gift to a dear friend. As true to her name, she is a beauty, like a sculpture encased in glass. The online picture is quite accurate, although the way natural light dances through her colors can only be seen in person. Of particular note is the exceptional brilliance of the blue, individually, & in concert & contrast with the other colors. Thank U, GoV! Everything went smoothly - purchase, shipping, delivery. I was notified in a timely way of all developments concerning the shipping and delivery. My cousin was extremely pleased with the gift and used words like "...the gorgeous vase!!!! It is stunning...such a special gift:)" and that, to me, is the proof of the pudding.